F/O Hull, Tech/CE, reported in from ADCHQ to take up duties as Construction Engineering Officer. F/C’s RC Hughes and BM Haines, URTP, on TD this unit for summer employment as AS/FrtC. First air spray carried out by 412 Transport Squadron, Ottawa. Exercise Cross Talk (Sector). F/L E Martin, Chaplain (P), transferred CUNEF, Naples, Italy. Mr. L Hebden of Northern Electric arrived for antenna check (communications). Two ECM runs by a C-119 from 104 (K) Flight. No problems. F/O M Wilson, Rec. Officer, ADCHQ, visited Senneterre for two days. Exercise Cannon Ball – B-52s. Not too successful. F/L Beasleigh left for Command Conference on exercise. F/L RS Turner, AS/FtrC, 2402 Squadron, reported in for two weeks cross training. Six VHF channels – receivers and transmitters were sent to Foymount. Promotions - F/O to F/L: F/L Wortley, F/L Chase, F/L Cunningham. 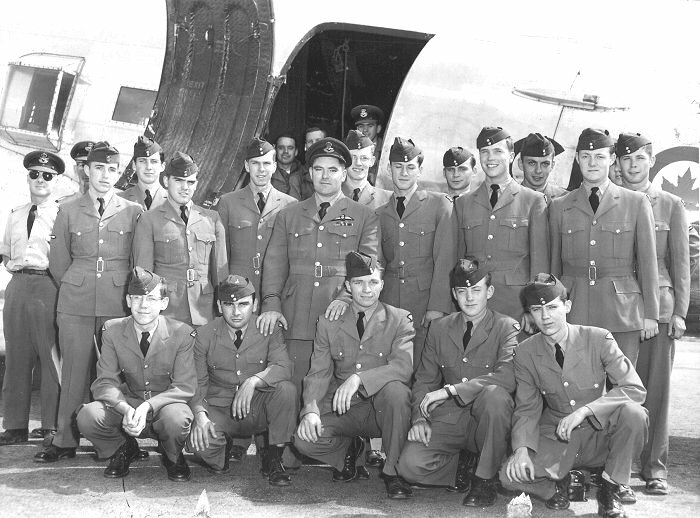 S/L B MacFie, CO 2402 Squadron, reported in for one month special duty summer camp. F/L JFA Hebert, SMO, transferred to Montreal and to Reserves. F/O OL Mallalieu reported in from Station Toronto to take over as SAO. F/L Matheral transferred to 64th Air Division, St. John’s, Newfoundland. Message centre prepared to handle all message traffic for Haffey Search. Haffey Search – search for missing aircraft CF-CRL continued until 26 Jul. Station Senneterre assisted with men and material. The detachment was open for approximately three weeks. F/L Cunningham, F/O Midgley, FS Villeneuve and FS Jessiman were employed full time at Val d’Or for the period. Approximately 30 spotters were sent per day resulting in 2600 hours spotting time. Sports weekend to Parent – approximately fifty Station Senneterre personnel participated in the various events. Search and Rescue – search for lost men in bush 60 miles from station. Fifteen personnel took part in search which continued until 14 Jul. Negative results – subject believed drowned or devoured. F/O Elliott, 2402 Squadron, arrived on special duty summer camp training. 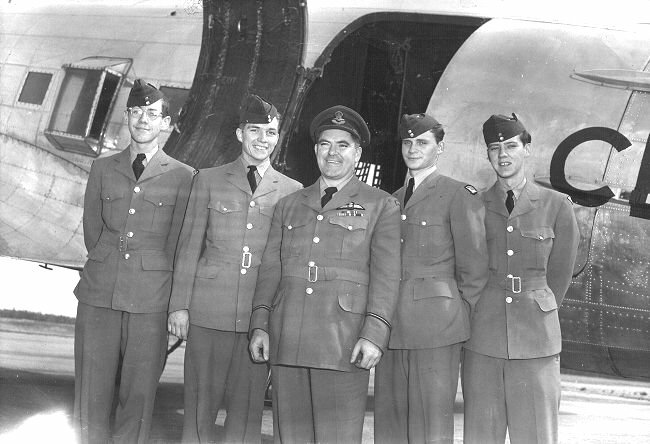 P/O MA Thessen, 2402 Squadron, arrived on TD for two weeks. F/L Scott, AS/FtrC, arrived on transfer. New Wire Chief, Mr. C Grant, arrived on unit. F/O Jergenson from 410 Squadron Uplands, reported in to be briefed by Senneterre personnel re Haffey search – worked with Searchmaster in charge of spotters. Missing aircraft spotted – two bodies recovered. 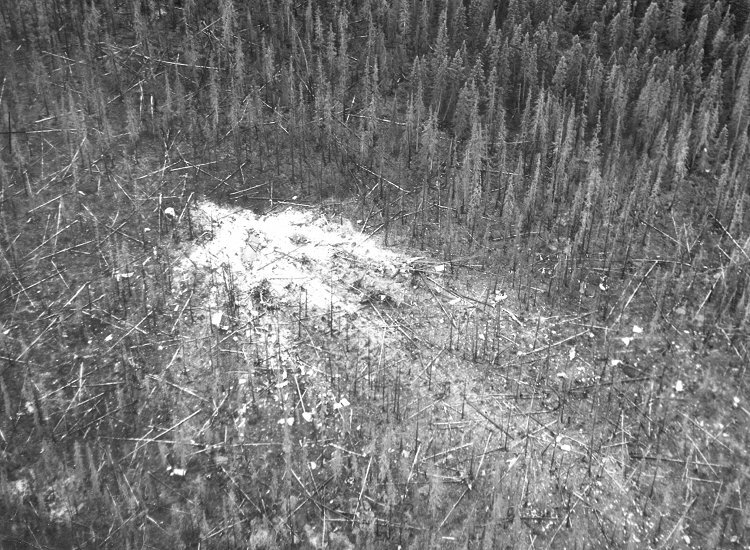 Aerial photo of CF-CRL crash site - 25 July 1957. 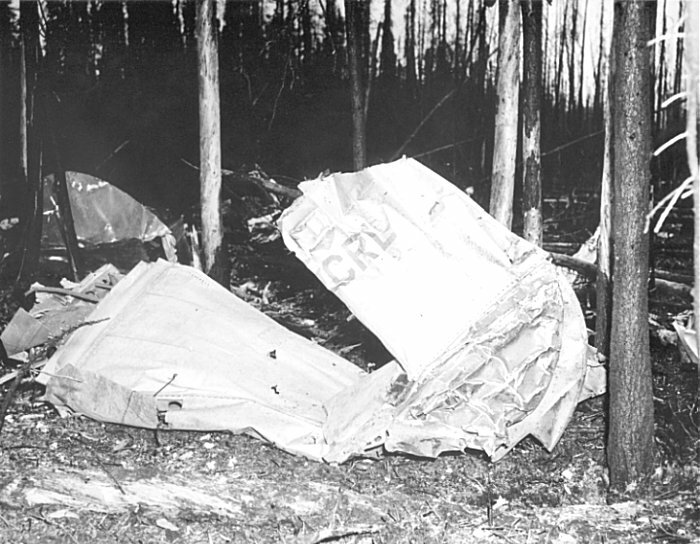 Ground photo of CF-CRL crash site - 25 July 1957. Sonograph representative arrived for installation of second recorder cabinet which consisted of three recorders for monitoring operations telephone positions. Peaking of prime Search Radar, FPS-3C by Northern Electric – continued until 7 Aug 57. Swimming pool (extension to Rec. Hall) completed. W/C Trischuk and F/L Gaudine arrived on TD from St. Hubert. F/L Clarke and F/O Paynter from Station Uplands arrived for four days special duty. Arrived on TD from ADCHQ, Mr. FE Haughian, C/CPO. Peaking of prime Height-Finding radar FPS-6 by General Electric – continued until 8 Oct 57. Mr. Hughes of Canadian Aviation Electronics began UHF conversion installation. F/O THE McCullough, AS/FtrC, transferred to Comox. F/L Sunstrum, Armament, arrived on TD from North Bay. On TD from 2402 Squadron – F/L Riddle, AS/FtrC. On transfer from Station Comox – F/O Tate, AS/FtrC. F/O Midgley, Pers/Admin transferred to Station Lachine. W/C EJW Higgin arrived at unit on transfer. Handing-over parade. W/C Higgin takes over command of station from W/C Duncan this date. W/C Duncan transferred to AFHQ. F/L PJH Sheasby from St. Hubert arrived with mobile jammer – lectures and films. C-119 and ground jammer both operating effectively. C-119 aborted, more ground jamming. C-119 ECM exercise aborted. On transfer to this unit from Clinton, F/O FW Carroll, Tech/Tel. Work began on TX1 extension. W/C CS Yarnell arrived on TD from Station Parent. Arrived on TD from London, Ontario – F/L H Bill, Chaplain (P). Exercise Blue Light – SAC. On transfer to this unit from North Bay – F/O JCVR Carter, Air/Obs. TD to this unit – from St. Hubert F/L CN Envoy and F/L WK Beattie; from Quebec Command, Lt. Colonel GW McCrary. Landscaping at Val d’Or detachment completed. F/O WJ Gliddon, AS/FtrC, arrived on TD from 2402 Squadron. Surprise ECM exercise – FC-25. F/L CH Jensen, Chaplain (P), transferred this unit from Station Lincoln Park. S/L GMK Davis arrived on TD from ADCHQ. Formal dance held in Officer’s Mess. W/C RR Steeves arrived on TD from ADCHQ. Extension to CE Building completed. Extension to Heating Plant completed. B-52 overfly – 2 fighters scrambled. ½ hour ECM – communications jamming. Removal by unit personnel of Serial 4 complementary Height-Finding Radar TPS-501. Struck off strength this date and on transfer to the Supplementary Reserve effective 14 Jan 58, F/O BB Phillips (Nurse). W/C Rodger and W/C Gallagher arrived from ADCHQ for official opening of Chapel. GObC alerted at 1600Z, sat until further notice for Sputnik rocket.